In a step aimed at transforming the state to a Food Processing Hub from Food growing one, the Punjab government and Government of Ontario province of Canada today mutually agreed to work in collaboration with each other for giving push to agriculture diversification and food processing industry.A decision to this effect was taken by the Punjab Chief Minister Mr. Parkash Singh Badal during a meeting with the high level delegation of Ontario province led by Minister of Agriculture Mr. Jeff Leal, who called on him at his residence this morning.Meanwhile, the Guru Angad Dev Animal and Veterinary Sciences University (GADVASU) and University of Guelph (Ontario) signed Memorandum of Understanding (MoU) in fields of Livestock Agriculture, Aquaculture, Food Processing and Veterinary Medicine in presence of Chief Minister, Cabinet Minister Mr. Adesh Pratap Singh and Ontarian Minister of Agriculture Mr. Jeff Leal. During the meeting both the governments agreed to mutually work to prepare a framework for the support and cooperation of both the states in field of Diversification of Agriculture, Food Processing, Dairy, Fishery and Piggery sector. It was decided that both the states would ensure the mutual trips of faculty, students and progressive farmers for better exchange of expertise in these fields. Likewise, it was also decided that University of Guelph (Ontario) and Punjab Agricultural University (PAU) would also explore the feasibility of better coordination in these fields.Taking part in deliberations, the Chief Minister said that there was a huge scope of bilateral cooperation in these areas as both Punjab and Ontario had demonstrated their strength and dominance in agriculture and allied farming due to their vast experience and expertise. He said that as both were primarily agrarian economies with very strong agriculture base so as to mutually benefit from technology transfer, cooperation and support. Mr. Badal urged the Agriculture Minister from Ontario province, Mr. Jeff Leal to carry forward the proposals mutually agreed upon by both of them to its logical end so that these should not merely confine to the papers.Underscoring the need for students and teachers exchange program, the Chief Minister said that the modalities in this regard could be worked out and formulated mutually by both the governments. He also laid thrust on need of Farmers' Exchange Program for fast and easy transfer of technologies to the fields for introducing new and scientific farm practices to the Punjabi farmers. 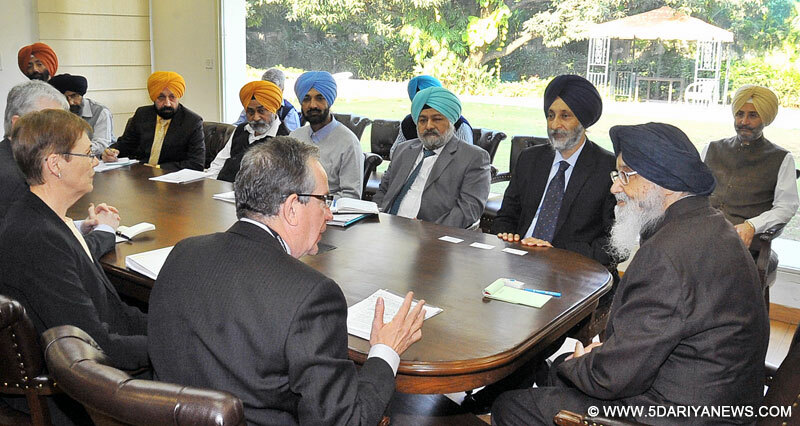 Mr. Badal invited the leaders of food processing industry of Canada to set up their ventures in the state adding that the Punjab government would provide fulsome support and cooperation to them.Taking part in deliberations, Mr. Jeff Leal said that there was a tremendous potential for the mutual cooperation in the other allied sectors of agriculture and animal husbandry. He also assured Mr. Badal of every technical help in the arena of food technology, food processing, nutrition and Agri bio-technology.Prominent amongst other present on the occasion included Cabinet Minister Mr. Adesh Pratap Singh Kairon, Additional Chief Secretary Mr. NS Kalsi, Special Principal Secretary to Chief Minister Mr. Gaggandip Singh Brar, Secretary Irrigation Mr. Kahan Singh Pannu and Commissioner Agriculture Dr. Balwinder Singh Sidhu. The visiting delegation included Deputy Minister Ms. Deb Stark, Consul General of Canada Mr. Christopher Gibbins, Vice Chancellor University of Guelph Dr Franco Vaccarino, Mr. Andrew Mitchell, Mr. Jason Langerquist and Mr. Randy Jackiw.